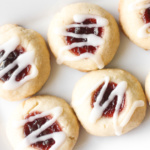 Soft, buttery, melt-in-your mouth jam-filled thumbprint cookies with almond glaze are the cutest, festive treat to make. Add the flour gradually until your mixture has formed a dough. Shape the dough into a ball (it will be a little crumbly). Tightly wrap the dough with plastic wrap and chill for at least one hour in the refrigerator. Roll dough into 1 inch balls, and place on a parchment lined cookie sheet. Make an indentation with your thumb (or the back of a small spoon) into the centre of each ball. The edges may crack slightly. Fill the indentation with jam. But be careful that you do not overfill the indentations. Place cookie tray into refrigerator while the oven preheats. Bake the cookies for 13-15 minutes or until edges are lightly browned. In a medium bowl, whisk together the confectioners’ sugar, extract and 1 tablespoon of almond milk. Add enough of the remaining milk until you reach the consistency that you like. If the mixture is too thick, add more liquid. If it is too thin, add more sugar. Using a spoon or a piping bag, drizzle glaze over the cooled cookies. Let set for 1-2 hours. You can store these cookies in an airtight container for up to 3 days at room temperature.